Goebel Hummel figurines have been a favorite amongst collectors for many years. This figurines usually depict children doing various activities. Hummels are earthenware figures that are hand painted with warm color pallets. 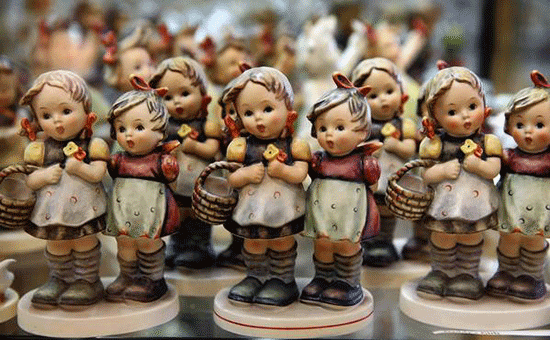 1 Common Places You Can Find Goebel Hummel Figurines. Common Places You Can Find Goebel Hummel Figurines. You can find Hummels for sale in a variety of places. Here is a list of some of the more common places to find Hummels for sale. There are many different types of Hummel items that have been produced and sold over the years. It is a good idea to have a price guide handy if you are planning on becoming a collector or looking to sell your collection. Prices can vary drastically from one place to another. Hummel prices fluctuate each year however the more rare ones tend to have a more consistent value. 1934: Goebel started to looking at producing a line of figures that captured the innocent and sweetness of children. Franz Goebel, saw drawings by Sister Maria Innocentia (Berta) Hummel and approached her about creating the Hummel line of figurines. Sister Maria Innocentia Hummel was born Berta Hummel. At the age of 18, she attended The Academy of Applied Arts in Munich. When she graduated in 1931 she entered the Franciscan Convent of Siessen. This is when she took the name Maria Innocentia. The convent was focused on the arts, this allowed Sister Maria Innocentia to create postcard featuring children. These works of art where also featured in art books. This was where Franz Goebel discovered Sister Maria Innocentia. After Franz saw these drawing the first three clay models were produced. The product of these models were completed in 1934 and shown to Sister Maria Innocentia. This is when she agreed that Goebel could use her images to create designs for Hummel figurines with one condition. Sister Maria Innocentia had final approval of each piece, and that each piece bear her signature. This tradition continues even today. Each Hummel is marked with “M . I . Hummel,,” printed on or incised in the underside of the figurines. When Sister Maria Innocentia died in 1946 the approval condition went to the Convent of Siessen and they must approve of each figurine before production. 1946: Sister Maria Innocentia’s health took a turn for the worse. She died at the age of 37 of respiratory complications. This was later found to be tuberculosis. Sister Maria Innocentia Hummel left behind an impressive collection of drawings, allowing the production of figurines to continue after her death. 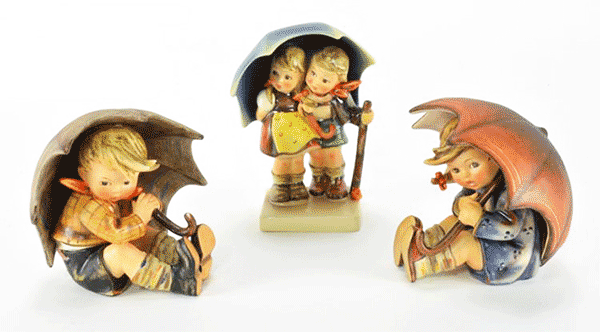 1935: Goebel Hummel figurines were launched in March of 1935, at the Leipzig Spring Fair. 1939: When the Second World War broke out, the German government only allowed the Goebel factory to produce Hummel figurines for export. During this time of war the Goebel factory was commandeered by the German government to product dinnerware for the German military. 1949: In post-war Germany, the figurines became popular once more. U.S. soldiers stationed in Germany sent these figurines home as gifts. This introduced them to American homes and made more popular than ever. 1977: The Goebel Collector’s club was founded. 1989: The Goebel Collectors club was opened to fans all over the world, and the name was changed to the M . I . Hummel Club. 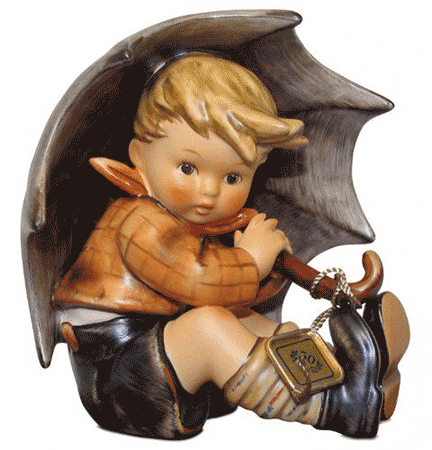 2008: Goebel stopped products of Hummel figurines. 2009: Manufaktur Rodental GmbH acquired the brand rights and started producing figurines on a smaller scale. Note: Goebel produces figurines that are not affiliated with Hummel. In other words, not all Goebels are Hummels, but all Hummels are Goebels. Note: The artist’s stamped or incised signature should be on each piece, regardless of the era. Note: Goebel stopped producing Hummels in 2008. Production was started again by Manufaktur Rodental GmbH in 2009. Hummel products now have the TMK 9 mark of a broken oval containing the words “Original M.I. Hummel, Germany,” with a bumblebee. There are other markings that can be found on Hummel figurines. These markings usually have to do with size or decoration variations. The following article will explain the Hummel numbering system in-depth. M.I. Hummel figurines are models of the drawings of Sister Maria Innocentia Hummel. However the Berta Hummel products and figurines are inspired by her artwork. These figurines are not models of her drawings, but are authentic Goebel Hummel products. They were produced in the Far East until they were discontinuation in 2007. First thing any collector should have is a reliable guide to Goebel Hummel Collectibles. Next a collector should focus on items they love, rather than collecting for investment purposes. Fluctuations in the Hummel market could mean that items can decrease in value. Owning a piece that is special for reasons other than investment purposes means that the item never loses value to the collector. One major thing to remember when collecting porcelain or anything collectible is condition matters. Condition is one of the biggest things that can effect the value of an item. In this section I cover some of the things to look out for when you are buying and antique or collectible. Crazing – Crazing is thin, spidery cracks in the glaze of a porcelain item. Make sure you do adequate research as this will ensure you are knowable and do not get ripped off or make a bad purchase. Remember you can also have your items valued and authenticated by a professional if you have any doubts. When purchasing Hummels from a seller make sure you ask the following questions. Question: How was the item stored? If Hummels where stored or displayed in the following conditions it can cause damage or crazing to happen at a faster rate. Question: Has the Hummel been damaged or repaired? Questions: Do you know the history of the figurine? Place your Hummel on a flat surface and cover the air hole on the base of the figurine. Brush over your Hummel using a soft brush such as a makeup brush that has been dipped in lukewarm water with a mild soap. Rinse the figurine carefully with a soft cloth that has been dipped in clean water to remove any soap. All each item to air dry. When you display your Hummels they should be displayed without touching each other. You want to keep them in an environment where they are not exposed to temperature extremes hot or cold. Whether you collect Hummel figurines for their cute and adorable design or as an investment, it can become addictive. Both experienced and novice collectors should make use of a current collector’s guide in determining the value of collectibles. You should also remember to care for your Hummel and store them properly so they can retain their value and stay in your home and collection.